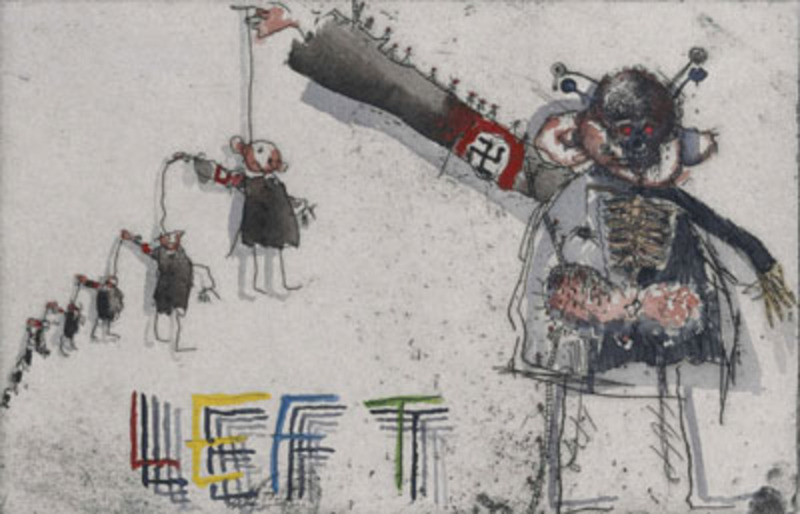 Jake and Dinos Chapman, Disasters of War IV, 2001, one of 83 hand-colored etchings with watercolor, each 9 5/8 x 13 9/16. One putatively verboten move after another, executed with fastidiousness and glee—that’s Jake and Dinos Chapman’s modus operandi. Retrofitting reverenced subjects with insolent supplements—such as giving child mannequins sexual organs for facial features, defacing original Goya prints in comically juvenile fashion, and creating faux-ethnographic displays with hand-carved McDonald’s logos—underscores the artists’ superiority to the scopophiliac hordes via fanatical attention to detail. The conspicuous void in this midcareer survey falls where the British brothers’ concentration camp–themed masterpiece, Hell, 1999–2000, should be (it was destroyed in the 2004 Momart fire). But the seventeen sculptures, two installations, and some three hundred paintings and prints made since 1992 will no doubt still offer a brilliantly assaulting display and a measure of our societal hang-ups.